This guide explains how you can easily add products using the Orno Smart Living communication protocol on the home automation system eedomus, using the USB dongle RFPlayer. We aim to cover many different home automation systems that are compliant with the RFPlayer. We already discussed the RFPlayer on this blog. It’s a communication gateway, connected through USB, for various home automation protocols. It transmit and receive signals in various protocols, thanks two its two antennas which allows it to communicate on the 433 MHz and 868 MHz frequencies. It also has some other built-in features, and we advise you to read our post of introduction to the RFPlayerto discover them. 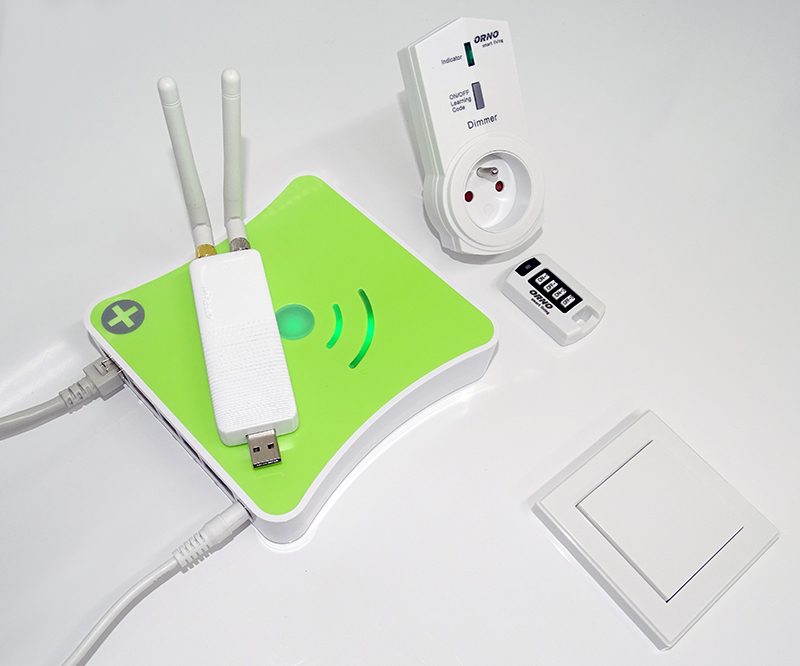 Eedomus has Z-Wave built-in, but one of the big strengths of this system is its two USB ports, which allows to connect various devices (such as an USB-to-3G/4G dongle to keep an Internet connection in case of default), or extension to communicate in wireless protocols. For example, the eedomus can make use of an EnOcean gateway, or a gateway bringing many protocols, like RFXCom since some years, or in this case, the RFPlayer, which is totally compliant with the eedomus since its update of February 2017. The icing on the cake is that using a RFPlayer on an eedomus is quite easy: we just have to plug the RFplayer on one of the USB ports at the back of the eedomus (while taking care of spreading the antennas to avoid them to interfere with each other), directly, or through an extension cord or a USB hub. The RFPlayer is directly ready to use and the user can configure it and see the radio frames received by the RFPlayer.